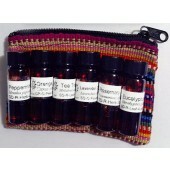 A pack of 6 Organic Pure Essential Oils including Lavender, Tea Tree, Eucalyptus, Orange, Peppermint, Rosemary. All contained in a convenient little zipper pouch! Also Included is a Handy Reference Card giving Suggestions on How to Use them Safely and Effectively. All of our Organic Essential Oils are NOP/USDA certified which means you can rely on receiving truly Certified Organic Essential Oils. They are 100% pure and natural and are free of herbicidal residue, pesticides and synthetic fertilizers. We acquire them from quality distillers all around the world. 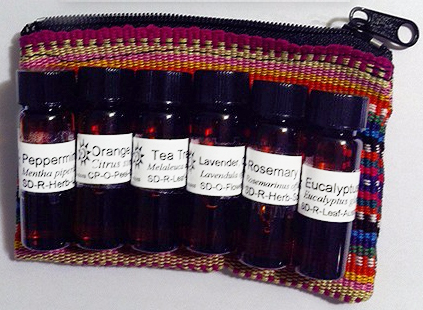 These Essential Oils have been Tested by State-of-the-Art Gas Chromatography which rigorously tests the Veracity of the Purity and Potency of our Sourced Oils.